When that Space Battle gets too heated up you need to reach for that Gundam Quencher. 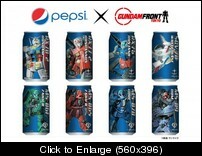 Gundam fans will have even more reason to stack up the caffeine and sugar this summer. The famous Mobile Suits will be adorning Pepsi cans in Japan, making the urge to pop the top even stronger for Japanese Otaku. The cans will go on sale August 7th, and feature some beautiful classic designs. there are 16 cans available now!! !